Get up to 60% Off Disney Tsum Tsums from Shop Disney! 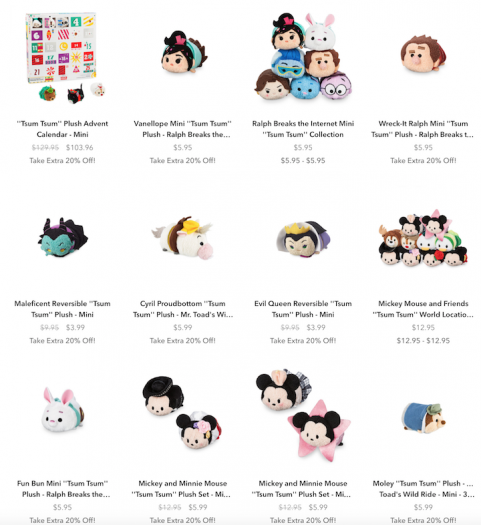 Home » News » Get up to 60% Off Disney Tsum Tsums from Shop Disney! It’s Black Friday and a great day to take advantage of some discounts on ShopDisney.com. Right now some Tsum Tsums are up to 60% off plus collectors can take an Extra 20% Off their purchase with the Code: AMAZING. Click on the link below and head to the Tsum Tsum section on ShopDisney.com and pick up some great new Tsum Tsums.